Published in Rafu Shimpo, June 17, 1953. 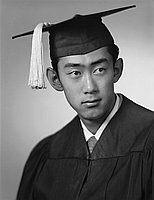 Studio head and shoulder portrait of Glenn Nakadate, a Garfield High School student who graduated with Ephebian Society honors, dressed in mortarboard and gown, Los Angeles, California, June 1, 1953..
Typed on original negative envelope: Nakadate, Mr. -- Cap and Gown. Glenn Nakadate, a graduate of Garfield High School dubbed as a member of the Ephebian Society, the highest honor along with 11 other Japanese Americans.